Lobsters are red, lobsters are blue and our lobster costumes are made for you. That's a little poem that we wanted to share with you in order to show you why you need to check out this costume collection. As great as that poem is, there's still something better: these lobster costumes. Browse our selection to find something for the whole family � something with claws and a tail, that is. 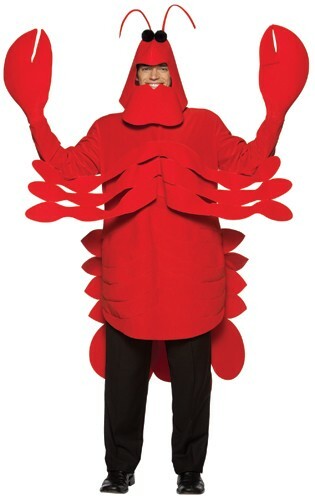 We have adult lobster costumes as well as sizes for kids. With us, you'll be able to find a fun costume for the whole family. Are you ready to start your Halloween adventure today? Then grab one of these outfits and hold on because you're going to take off on the Fun Coaster (located in Fun Park). This is where things get really good because our prices are so low that you'll be amazed. Heck, you might even turn red like a lobster. Now, we don't mean to toot our own horns, but we are very proud of our lobster costumes. And, we're happy to help all of our customers, many of whom would look great in these little red numbers.